The gnomon is the part of a sundial which casts the sun's shadow onto the dial plate, which is inscribed with the hourlines. In most sundials, the gnomon consists of a rod, or the side of a triangle, running parallel to the Earth's axis and pointing to the celestial pole. A vertical sundial , as the name implies, has its dial mounted vertically, usually on the wall of a building. in distinction to a horizontal dial which has its dial plate placed horizontally, either on the ground or on a pedestal. The Market Hall stands in the centre of the busy town of Shrewsbury. The stone Hall itself was built by the Corporation in 1596. High on the wall is this vertical sundial. From the position of the gnomon, we can establish that the wall of the building does not face directly south but somewhat west of south. 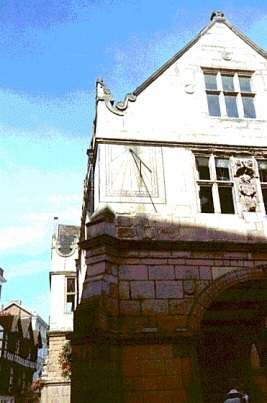 It is possible that the sundial was first put in place when the Market Hall was built, but most local people, who don't look upwards, are unaware that it is there. Because the building is now surrounded by taller modern buildings, the sun only lights the face of the dial in the middle of summer days, like the one when I took the photo.